The Health Services Department’s mission is to promote health in mind and body by assisting you in being successful during your college career at Clarke. By maintaining good health, you are better able to attend classes regularly, concentrate and deal with stress. Students are served through direct services, referral and health education. All health services are confidential. No medical information will be released without a student’s permission. Before you come to Clarke, there are a number of ways you can plan ahead to avoid or minimize the complications caused by illness. 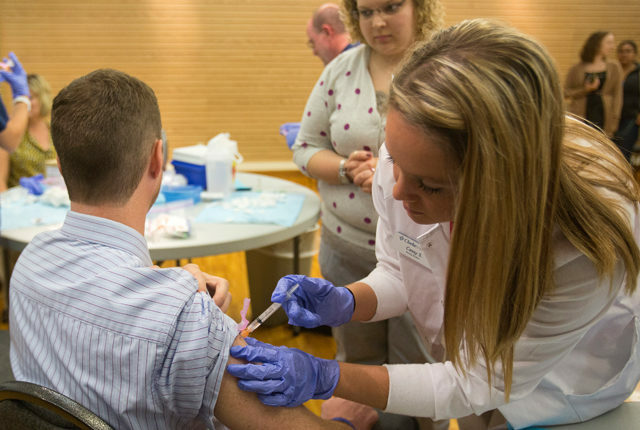 Update and bring a copy of your completed immunization records with you to campus. MMR (measles, mumps and rubella). Two doses at east one month apart if born after 1956. Varicella (chickenpox). Two doses one month apart if you never had chicken pox or if a blood test does not show immunity. Hepatitis B. Series of three doses. Tetanus (Td) booster at age 11-12 years and every 10 years. Meningococcal Polysaccharide (for meningitis). Recommended for high-risk students and as a consideration for all college students. Health Summary: Bring a health summary from you health care provider if you have chronic health problems (like asthma or diabetes). This helps the Health Services staff to provide you with the best possible care. We also suggest you make an appointment to establish care with a provider before you become ill if you have ongoing health needs. Prescription Medications: Bring enough of your ongoing medications for the first month of school and bring a copy of the prescription with you. Plan ahead for refills. Bring a first aid kit. Make sure it includes a thermometer. Once on campus, remember Health Services is available to all students, regardless of health insurance coverage. Health Insurance Coverage. If you are covered under a health insurance plan other than Clarke Insurance, bring a copy of your health card to campus. It is important to check the policy to be sure that you ace covered for “out of area” for non-emergencies. The staff members at CHS are pleased to work with you to keep you in optimal health. We would like your visits with CHS to be valuable, whether they are to learn about and maintain your health or to help you recover from illness or injury. We expect you to take an active part in your care. We can work together most effectively if you understand what to expect from us and what we expect from you. The following is a summary of your rights and responsibilities as a user of health services. Dignity: Have your individual dignity respected regardless of gender, race, ethnicity, national origin, culture, sexual orientation, class, physical ability, lifestyle or other human attributes. Privacy: Expect that your discussions, examinations and treatments will be conducted in a private environment. Confidentiality: Expect confidential treatment of all communications and records relating to you. Except as provided by law, you permission must be obtained before information is given to anyone not directly connected with your care. Before you consent to release of information, you may discuss what information will be released. Access to your records: Review your records or obtain a copy or summary of the record when necessary. Answer questions fully: Provide all information asked for by the practitioner so that we thoroughly understand your health condition. If you do not understand why certain information is necessary, please ask. Make sure you understand: Ask your practitioner about anything you do not understand concerning treatments, tests or policy. Report changes: Tell us about any changes in your health or adverse effects of any treatments. Know your health care providers: Try to know and remember the names of the people who serve you. We will do your best to make this an easy task. Respect your fellow patients and CHS staff: Show respect for your fellow patients and CHS staff by according them the dignity and courtesy that you expect to receive. Establish healthful habits: Take responsibility for your health by establishing healthful habits such as exercising, eating a healthy diet and not smoking. Avoid knowingly spreading disease.